Some games have a style or concept that is so different from anything that has ever been seen before that you can’t help but try it out for yourself. The Unfinished Swan is one of those games. Using paint to build contrast and shape the environment, it’s amazing how much depth can come from a single color. 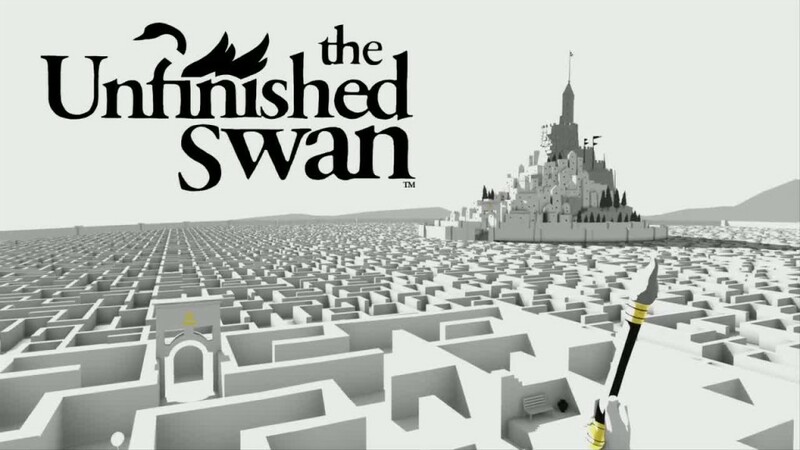 The Unfinished Swan is an artistic spectacle for sure, but it’s short campaign and simplistic gameplay hinder its lasting appeal. Presented like a children’s book, The Unfinished Swan tells the story of a boy named Monroe, who sets off in pursuit of a swan and lead to an abandoned kingdom devoid of color. Initially placed in an empty, white room, Monroe must splatter balls of paint onto the environment, creating enough contrast to reveal the world around him. A charming concept to experience that doesn’t get stale due to the new gameplay functions introduced in each of the game’s four chapters. 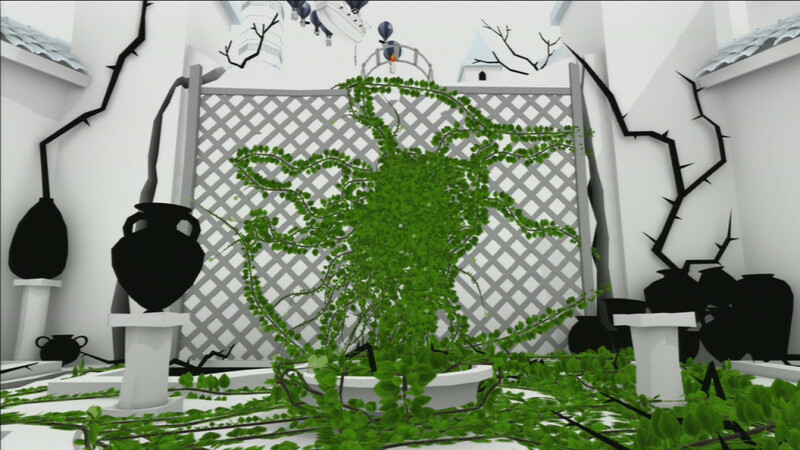 Throwing paintballs would get old after awhile, but later on those paintballs become water, allowing vines to grow on applied areas, creating a climbable path to reach new places. Streaks of green vines upon a near entirely bleached world provide brilliant highlights to the environment. Despite using a very simplistic control scheme, each new gimmick to gameplay changes your approach, often presenting a stylized view more beautiful than the last. Even though these additions were welcomed, I found the standard throw-paint-to-reveal–area to be the most memorable, but unfortunately, this method was quickly abandoned. Aside from narration between chapters, the rest of the story is revealed through paintings hidden along walls, highlighted by one large golden letter. Throwing paint on the adjacent wall reveals the painting, triggering the warming voice of the narrator as she reads the passage very much like a bedtime story. To no surprise, there is nothing groundbreaking to the story, and isn’t the reason to play the game. One thing that really stood out to me was towards the end of the game where there is a sequence that cleverly integrates the credits into the story. I wish more games would present their credits in such a creative way, just to break up the monotony. Those expecting a lengthy adventure are not going to get it with The Unfinished Swan. The game is extremely short, taking me only 2 hours to complete. There are balloons strategically placed throughout the environment that, once untethered, can be used to buy unlockables to enhance the game, but nothing available for purchase is that interesting or adds much to the lifespan of the game. Also, for a game that’s relatively puzzle driven, the puzzles aren’t difficult or barely can be considered puzzles at all. Sometimes complicated puzzles pad the length of games, but this is not the case. A world of white or black with splashes of color brilliantly highlights your path as a guide. Because of its style, the graphics will age pretty well. 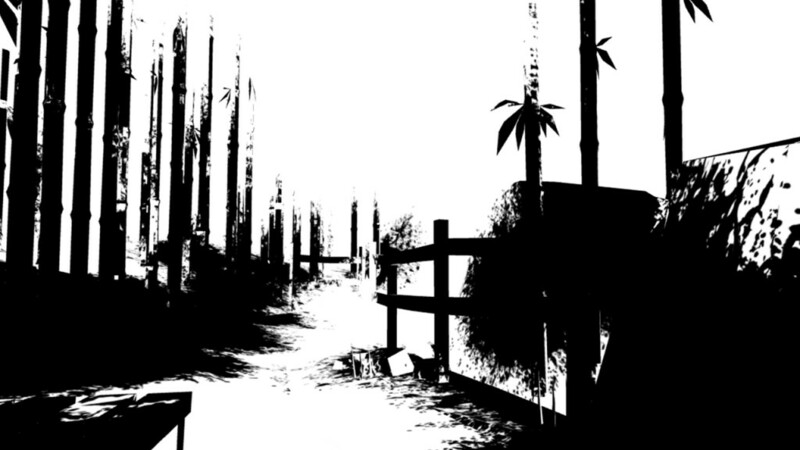 There were a couple sections of the game with a bright, white nothingness hiding the surroundings that became physically nauseating after a prolonged time, but that scenario was infrequent. 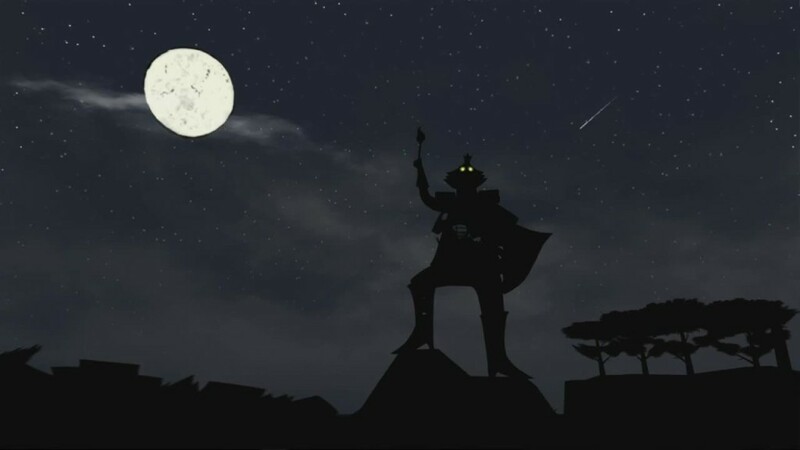 The very few characters with voice acting were adequate enough, and the music is beautifully scored. The Unfinished Swan wasn’t a game I would play had it not been featured as one of Playstation Plus’ free games of the month. Had I paid the full $14.99, I would have been disappointed due to the short length of the game. If you can pick up the game for cheap, it’s worth a look as it’s an experience like no other, however, I’m likely to not want to play it again. The Unfinished Swan is an artistic spectacle, but it’s short campaign simplistic gameplay hinder its lasting appeal.